Little Miss A. turned five this weekend. It was so exciting! We had been looking forward to this birthday probably since her actual fourth birthday (so yes, a full year!). So we invited four of her little friends to have a swim birthday playdate. 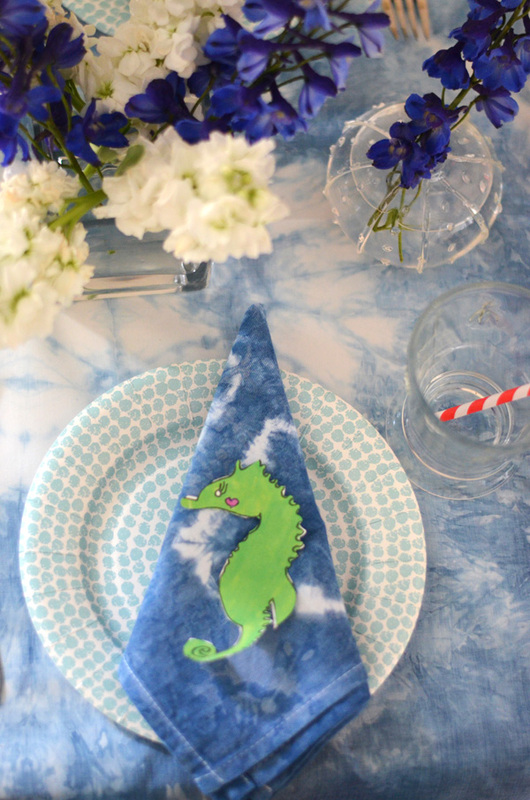 The theme was a seahorse. It was a tiny get together but very beautiful and special. Little Miss A's grandparents all came from abroad to help her celebrate. This is the amazing chocolate cake we made (recipe here). I highly recommend the recipe if you are a chocolate lover. It was easy, so moist and very, very good. This is coming from a girl who brings her favorite chocolate cake frozen in the plane whenever she travels to Miami (yes, the cake is in South Beach!). So I know what I'm talking about it. 1. Flowers. 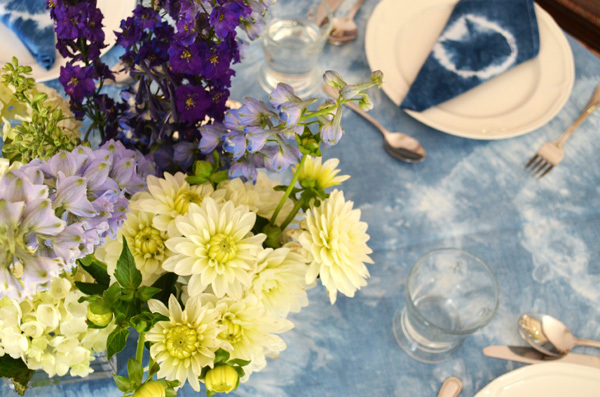 We had so much fun picking up fresh blue, white and purple flowers for our table. Little Miss A. loves arranging them so this was mostly her work. I think fresh flowers are worth the splurge. They dress up any table or any corner immediately. 2. Sea Creature. We chose a sea horse, of course because they are so cute. These were hand made and used in the invitations, for place settings, and for the favors. I just scanned, printed, and cut these to help decorate. 3. Tablecloth and Napkins. I got this dye kit here. How perfect to use blue and white to represent the colors of the ocean. 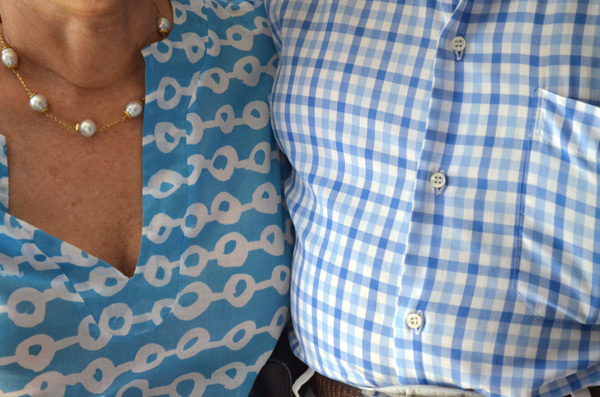 It was more than enough for twelve napkins, five t-shirts, and two tablecloths. I think we could have done plenty more but we just didn't have anything else we wanted to tie dye blue. I followed the instructions in the box, which even walk you through different tie dye methods to get varying effects. The napkins look great because they are all different from each other. We used wood planks, rubber bands, and even rocks. 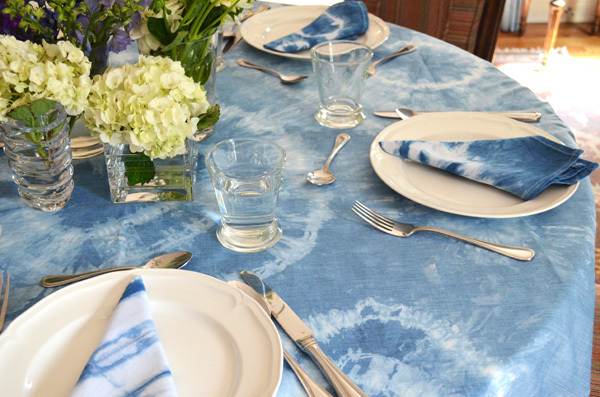 (Jessica from the Aestate has a wonderful Tie Dye tutorial here for more ideas) For the tablecloth I just bought some fabric from JO-Ann's and sewed into two tablecloths. For the napkins I bought these from target. They were great and only ten dollars for 12! Little Miss A. had a great time putting the rubber bands on and seeing the transformation of the fabric. 4. Balloons. 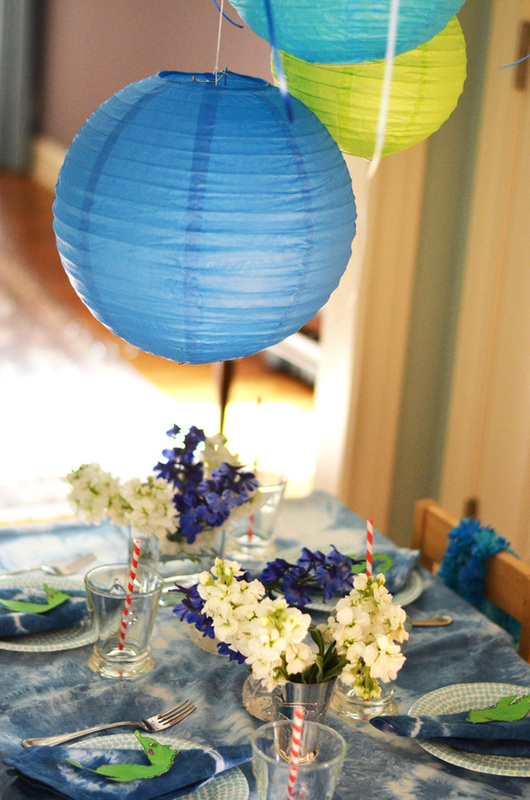 These are another great way to dress up and really decorate any type of celebration. They are so easy and festive, plus the kids have so much fun with them. We chose water colors of course! 5. Favors. For each of her friends we made a tie dye t-shirt. We got these from Target. The girls loved them. Octopuses or whales would be cute for boys.There you go! 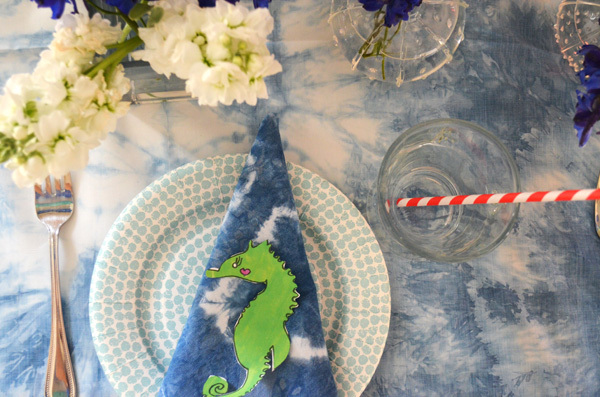 Five easy steps for a successful underwater theme party! Oh my goodness! The cutest party ever. I love the tie dye shirts! I know the girls were so proud of them -- little girls are so much fun! What, what a beautiful event - and beautiful photos too! Much more sophisticated than the plastic swimming pool and sprinkler party my daughters had in the front yard! Man, I'm kinda jealous of lil Ms. A! What a fab birthday soiree for the little one. Especially loved that you bucked the traditional pink and went with a blue and green. Great options for parents to consider for any kid. Happy belated birthday to her as well. it was the perfect party- girls have been in their shirts for 2 days- Jorge said that they were "so cool" and for him to notice something like this! WOW! Such a pretty party! Great job:)! This is adorable... Happy b-day to the little one!!! What a beautiful party...love the balloons!! What? how gorgeous!!! 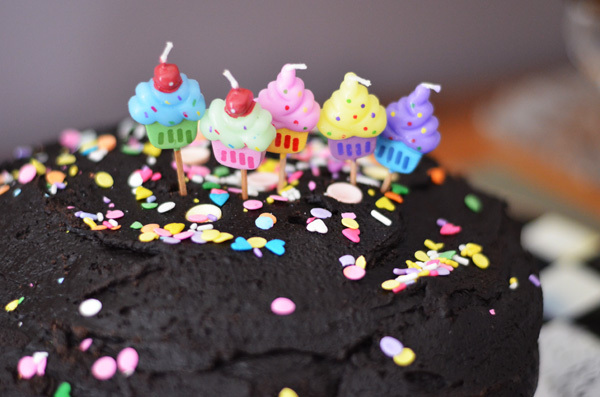 Happy B-day to your little one! Love every details, you did fantastic! This is so lovely! And what a great glimpse of your beautiful place! 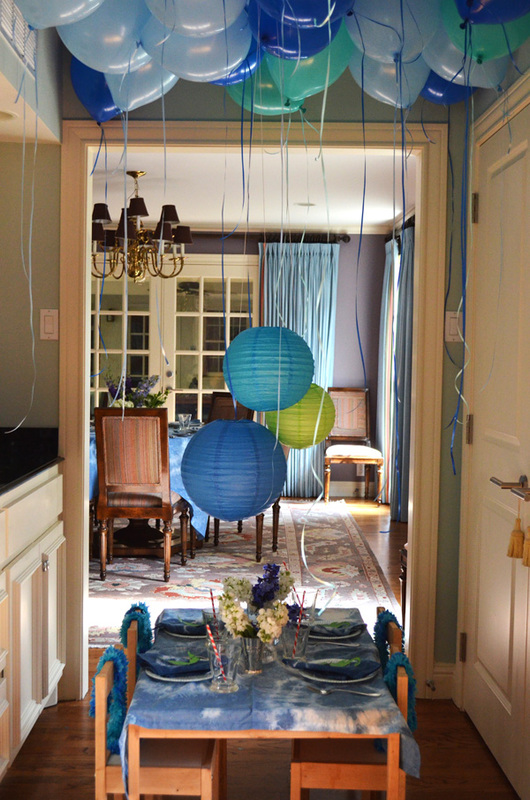 I am loving all the touches of blue.. Happy birthday to your daughter!